To this day, age-old techniques dating back hundreds of years are used to make bespoke suits. Although styles and fashions change, the method remains the same. Starting from scratch, your measurements and posture are drafted onto brown paper using a setsquare, tape measure, chalk and a very good eye. Your suit is then cut by Geoff, Scott or Wes and first basted fittings are created. The garment is checked over for fit and style before your basted fitting is ripped down to its individual pieces, re-cut and any final adjustments are made. The end result is your master pattern – the key to ensuring a beautiful fit. On average, to draft the master pattern and cut the suit takes up to half a day, without interruptions. From start to finish, anything from 55 man hours and over 5,000 hand stitches go into making a true bespoke suit. 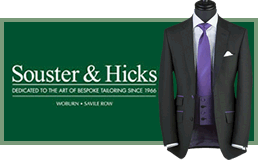 At Souster & Hicks we only use the finest fabrics and the best natural trimmings from top trimming merchants like Bernstein & Banley and Richard James Weldon to create our suits. We have taken the time to break down and explain our process to give you a better understanding of the time and detail that goes into creating a bespoke suit. Body Canvas - Made from the finest camel hair, it's available in many different weights, contents and textures. The canvas is used to construct the chest area of the suit jacket. We use the softest, lightest weight canvas on the market for a more luxurious feel. Domette (breast felt) - Made from 100% cotton, this is the final part in the construction of the chest, which also gives the coat a soft feel. Lapthair - Made from horse hair, Lapthair is a very stiff and course fabric. It is these characteristics that help to keep shape to the chest of a bespoke jacket. Collar Canvas - Made from extremely stiff linen, the collar canvas is used to form the shaping of the one-piece collar. For ready to wear and factory made to measure you must have a two piece collar (seam inside) because only craft tailors are able to shrink and shape the collar. Under Collar Melton - Made from 100% wool, this is also used to construct the collar and is visible if you were to lift the collar up. It is always cut on the bias to help stretch and go round the collar without the collar puckering up. Sleeve head wadding - Made from foam, cotton, viscose and goats hair, this is placed and sewn into the crown of the sleeve to give the crown a "roped" look; a very common look with fully hand tailored bespoke suits. Shoulder Pads - Made from a viscose & cotton. Shoulder pads come in a variety of thicknesses, depending on the client’s shape we will determine what is used. For instance someone with square shoulders would require a thin pad, whereas someone with sloping shoulders would require a thicker pad to add shape back in. Silesia - Made from 100% cotton, silesia comes in a variety of weights and colours. Silesia is used for all the pockets on the inside of both the jacket and trousers. Banroll - Made from 100% cotton, banroll is placed inside the waistband of the trousers. The stiff finish adds a sharp look and stops the waistband from rolling over. Linings are all sewn in by hand using the best quality viscose, satin or bemberg. With many years of experience, the Sousters (Geoff, Scott & Wes Souster) have personally hand drafted, cut and fitted over 30,000 bespoke suits between them. The handmade bespoke suit service is known to be on par with the best bespoke tailors in the world and is very competitively priced. 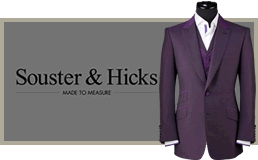 Using state of the art tailoring methods you have two choices for a made to measure suit. is a fully canvassed construction that’s made in Italy, ideal for the person that prefers and appreciates the lighter weight softer feel. These suits feature some hand tailoring and are impeccably made. is a half canvassed construction. Should you not have had a suit tailored before this will give you a great insight into the bespoke tailoring world, and you’re able to create a made to measure suit that fits, feels and looks better than anything off the peg. 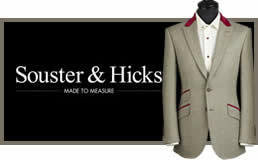 These entry level made to measure suits start from £750. To arrange an appointment, please call the shop on 01525 290862 or fill in the contact form to let us know what you require.